The Joe Vosmik story is the classic American tale in which the scion of an immigrant family falls in love with the national game of the family’s adopted country. Vosmik’s tale has all the required elements: precocious skills, early passion, an indulgent father, a disapproving mother who later relents and shares her son’s ardor, obsession, truancy, and even an officious school administrator who proclaims: “the boy will never amount to anything”. Not only did Joe Vosmik amount to something; he became a baseball star for his hometown team, and at his peak, one of the better players in the American League. Joseph Franklin Vosmik was born in Cleveland, Ohio on April 4, 1910 to Josef and Anna (Klecan) Vosmik, immigrants from Bohemia (then part of the Austro-Hungarian Empire, now part of the Czech Republic). Josef was a naturalized citizen who may have immigrated as early as 1879 (or as late as 1890, census records vary). He worked as a machinist, a “sawman”, a stockroom manager, and even a cigar roller. Anna Klecan immigrated in 1890 and was naturalized the next year. The two married in the United States, likely in the late 1890’s. Joe was the first son after the Vosmiks had five daughters (Anna, Amelia, Elsie, Lillian, Marie). Younger brother Edward came three years later. It was around the time of his brother’s birth that Joe’s future avocation started to percolate. It seems that young Joe Vosmik showed passion for baseball as a toddler. Joe started playing catch in the streets of Cleveland even before beginning school. He saw his first action at Dunn Field (later called League Park), starting around the age of 10. “When I was in the fourth grade I began playing truant to go to the Indians’ ball park and watch the big league players,” he recalled. “Soon after, I began finding ways and means of sneaking into the stadium but most of the time I was kicked out as soon as I got in. But I had made up my mind to be a professional ballplayer and nothing discouraged me.” Not that many years later the Indians were paying him to play. In 1929 Joe played for the Frederick (Maryland) Warriors, the Class D Blue Ridge League farm club of the Indians. With Frederick Joe hit .381 in 407 at-bats, with nine homers and 63 other extra-base hits for a .661 slugging percentage. He had good speed; his 24 or 25 triples (figures differ) set a league record. He was second in the league in batting average, but he admitted to Brundidge that he was an “awkward outfielder.” The Cleveland newspapers, a bit confused geographically, dubbed him the city’s “blond Viking”. The Hartford Courant predicted that the “big, blond youngster” (Vosmik was an even 6 feet tall but weighed in at 185 pounds) “may be the find of 1931.” His debut with the Indians saw him pinch-hit in vain in the ninth inning of the September 13, 1930, game against Philadelphia – facing Lefty Grove. Joe grounded out to second base, but collected his share of hits for manager Roger Peckinpaugh. Vosmik’s first major league hit came on September 20, 1930 at home against Boston’s Milt Gaston. He had a 2-for-5 game that day against the Red Sox (driving in two) and a 2-for-4 game against St. Louis on the 27th, again driving in a pair. Those were his four RBIs for his abbreviated season; his average took a big hit when he suffered through an 0-for-10 doubleheader. Vosmik finished his brief 1930 debut with a .231 average in 26 at-bats. For the next 10 years, Vosmik was a major leaguer, though he confessed in August 1931 that he still ducked every time he saw one of the Cleveland ballpark’s guards or gatemen come by: “I’m still afraid I’ll be recognized and bounced out.”  With Tris Speaker in the stands on Saturday April 18, 1931, Vosmik went 5-for-5, with three doubles and a triple. The effort seemed to cement him as the team's left fielder. Joe blistered the ball in early going, hitting safely 14 of his first 22 times at bat, with eight of the 14 hits going for extra bases. Not surprisingly, he cooled off some and he rode the bench for just a couple of days, then got in about as full a season as one could hope for, playing in 149 games. Vosmik hit .320 his rookie year (1931) and drove in 117 runs, a tremendous accomplishment and, at the time, the third highest single-season RBI total for a rookie in major league baseball history. He led his team in triples with 14, which was good enough for fourth in the AL. He, along with Averill, led the Indians in doubles with 36. His 189 hits were eighth in the league. Had there been a Rookie of the Year award in 1931, Joe Vosmik might have contended, though 22-year-old rookie Lefty Gomez, who was 21-9 for the Yankees would have been a pretty solid choice. Vosmik had an equally fine sophomore season, driving in 97 runs and batting .312, while scoring 106 runs. He was honored in his hometown with Joe Vosmik Day on June 22, and went 2-for-4 with one RBI in an 11-2 shellacking of the Senators. Joe failed to play full seasons in 1933 (119 games) and 1934 (104 games), hitting just .263 in ’33. A number of articles in May 1933 discussed Joe’s vision. He saw an eye specialist, but the more likely cause was a bout of the flu that affected his eyesight for a spell. Hit by a pitch, Joe suffered a broken right hand on Labor Day in 1933, which cost him the rest of the season. He shone in 1934, in more limited action, placing fifth in the race for the batting title, hitting an excellent .341. Joe was far and away the most difficult man in the AL to strike out in 1934, fanning only 10 times in 405 at-bats. In his career, Vosmik finished in the top 10 in this category five times. He was primed for what became his best season, 1935. Vosmik put it all together in 1935, leading the league in hits (216), doubles (47), and triples (20), becoming the first player in the AL to lead outright in those three categories since Ty Cobb did it in 1919. He drove in 110 and just barely missed the batting title by percentage points on the final day of the season: .3483 to Buddy Myer’s .3490, when Myer went 4-for-5 in the final game of the year. The All-Star Game had been held in Cleveland in 1935 and Joe received a two-minute standing ovation when he came to the plate, the hometown showering its appreciation on its native son. Vosmik came in third in the American League MVP race, finishing behind Detroit’s Hank Greenberg and Boston’s Wes Ferrell but just ahead of Myer. After the season, Vosmik signed a new three-year deal with the Indians for a reported $37,000 total, the Cleveland club turning down a purported offer from the New York Yankees to sell Averill and Vosmik for $241,000 - the odd sum said to be the total of losses over the eight-year tenure of Indians owner Alva Bradley. The Yankees denied making the offer. Joe still lived at home, and had drawn extra crowds to the ballpark, attracting a number of Central European immigrants who had never before followed baseball. There was one discordant note: In August, he was sued for $100,000 by Minnie Barr, who alleged breach of promise, charging that back in 1928, when he was 18, he had promised to marry her. His “attentions ceased in August, 1934”, according to the Associated Press. The suit was settled out of court. In November 1936, Joe married Sally Joanne Okla. The couple had three children: Joseph Robert, Larry Earl, and Karen. Joe seemed to have lost some of his skill, suffering a serious slump, and a benching, early in 1936 before rebounding to a .287 average by season’s end. Despite the lower average, he nonetheless drove in 94 runs. The Indians, though, had dropped to fifth place and decided to make a move. In mid-January 1937, they traded Joe, Oral Hildebrand, and Bill Knickerbocker to the St. Louis Browns for Ivy Andrews, Lyn Lary, and Moose Solters. 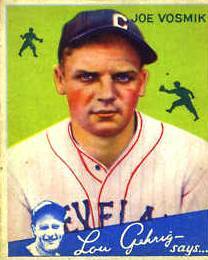 Vosmik played for the eighth-place Browns just the one year, but performed well, batting .325 and driving in 93 runs. He was fourth in the league with 47 doubles. After that fine year, in December 1937 the Red Sox shipped Bobo Newsom, Red Kress, and Buster Mills to the Browns to secure Vosmik as their left fielder. They’d tried hard to get him before the ’37 season, offering third baseman Mike Higgins and more to the Indians, but were turned down. Now they’d bagged their quarry. A few days later, general manager Ed Barrow of the Yankees said, “We offered no fewer than five players for Vosmik, who is my idea of the type of left fielder we could use at the Stadium.”  Joe was 27, and looking forward to playing in Fenway. The sandy fields in Clearwater and in some of the other Grapefruit League ballparks weren’t good for Joe, who did have concerns about his legs. His ailment early on, however, was a rib injury in May, suffered in a collision with Cardinals shortstop Marty Marion. Into mid-June, Vosmik was slumping. He hit .282 for Brooklyn but his productivity was down. He drove in exactly half as many runs (42) as the year before and scored only 45. In late February 1941, Joe suffered a big scare while the team began to train in Havana. A bottle of medicine he'd purchased at a local farmacia exploded as he opened it, blinding him for more than two hours before a physician was able to treat his eyes sufficiently to restore his sight. He opened 1941 with the Dodgers, but was released on Independence Day. He was hitting just .196 and every one of his 11 hits had been a single. Gordon Cobbledick of the Cleveland Plain Dealer felt that the Indians should have scooped up Joe, and not just out of sentiment. He thought Vosmik still had some good baseball in him and that his disappointing play in the National League may have been in part psychological: “Joe was unhappy from the beginning of his connection with this Brooklyn club” – though Joe never said as much publicly. Vosmik had already made it clear a year or two earlier that his ambition after his playing career was to become a manager in the minor leagues, but he wasn’t ready to give up as a player yet. Herb Pennock, the Red Sox farm director, approached Joe and signed him to Boston’s Double-A Louisville Colonels, where Joe appeared in 42 games, batting .292. He played for the Minneapolis Millers for the next two seasons, hitting .304 and .253 respectively. With World War II on in earnest, Joe took wartime work with Thompson Aircraft Products in Cleveland but became embroiled in a minor controversy. Lou Boudreau of the Indians had said in January 1943 that Vosmik could be a great addition to the Cleveland club. But no one from the Indians ever contacted Minneapolis owner Mike Kelley. Joe, seeing the possibility of getting back to the majors, wrote Kelley to say he’d simply quit if he didn’t wind up with a major-league team. Kelley wrote back, saying he didn’t blame him, but then threatened to report Cleveland for tampering. As matters worked out, Joe played the full year with the Millers. He began 1944 with the Millers, too, but refused to report in a salary dispute, continuing to work in a Cleveland defense plant. On June 7, Vosmik signed with the Washington Senators; he appeared in 12 games, batting just .194. He was released on July 25. Later reports suggest he may have suffered from “chronic leg trouble.” He announced his retirement on February 21, 1945, leaving major-league ball with a lifetime .307 average. Vosmik produced 1,682 hits including 335 doubles and 874 RBIs in 1,414 games. Immediately after baseball, he continued to work in the war plant, and also with a local brewery. In April 1947, Vosmik achieved his managerial ambition, named to skipper Cleveland’s Class C Tucson Cowboys (Arizona-Texas League). The team finished in second place, with an 80-52 record. Joe played in 30 games, batting .354. He managed the Dayton Indians (Class A Central League) in 1948 and the Double A Oklahoma City Indians in 1949 and 1950. He even squeezed in another 20 at-bats for Oklahoma City in 1949, batting .350 with one final home run. In midseason 1950, he had to be hospitalized for stomach ulcers and was reported to be “seriously ill.” A week later he was replaced as manager by Tom Reis for the rest of the season. Joe had already reportedly contracted pneumonia and needed the rest. The Indians gave him work that winter, helping to sell season tickets. He said he’d help the organization in any way he could and later that summer, he filled in as temporary manager for the Batavia (New York) Clippers of the Class D Pony League when the manager there became ill. For three seasons, through 1952, he worked as a scout for the Indians. Joe later took up work selling automobiles and then as an appliance salesman for Sears Southgate, an area department store, but developed a cancerous lung tumor and was operated on at age 51. The operation appeared to be successful, but after a week in the hospital, Joe contracted pneumonia and he died on January 27, 1962. In 1993, Joe Vosmik was honored by his home state with an induction into the Ohio Baseball Hall of Fame. Thanks to Fred Schuld for supplying a great deal of information on Vosmik’s career, including a copy of his Hall of Fame file. Maurice Bouchard added considerable insight to this biography. Brundidge’s article appears in the St. Louis Star, August 12, 1931.